In France, the law of 3 January 1992, called “Water Law”, laid down the principles of integrated water management with, in particular, an aim at preserving and protecting aquatic ecosystems. But awareness of degradations in rivers at European level and the changing economic context led to the implementation of a European policy for aquatic environments: the European Water Framework Directive (WFD – text of the Directive), on 23 October 2000. The Water Framework Directive was transposed in France by the 21 April 2004 law (text of the law), establishing a framework for Community action in the field of water policy. The Law on Water and Aquatic Environments of 30 December 2006 (text of the law) finally renovated the whole water policy and provided tools for achieving the objective of good status required by the WFD. rivers where hydraulic structures may be installed provided they are no longer an obstacle. rivers to restore, where sediment transportation and fish migration have to be ensured. This classification contributes to the establishment of a Blue Infrastructure for aquatic ecosystems. See the lists of classified rivers in France. Many of the principles ensconced in the WFD were already built-in to French water law. For example, France was already divided into hydrographic areas for the management of water resources. management plans to set the environmental objectives. In France, the RBMPs (river-basin management plans) and the SBMPs (sub-basin management plans) are the main tools for achieving good ecological status of water resources. They exist since the 1992 Water law. programmes of measures which list the measures designed to reach the objectives. River restoration represents a central part of the Sub-Basin Management Plans, It is also one of the five key priorities of the 10th Water agencies planning programmes, for the period 2013 to 2018. 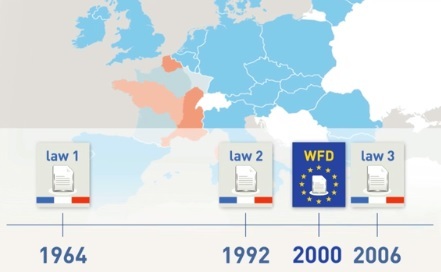 To understand how the French water policy is implemented, you can see a video realized by Onema that tells the story of the French water policy, its principles, its challenges, and presents the actors participating in its implementation since the three main water acts entered into force (1964, 1992 and 2006). It plans operations with other ministries competent in certain specific sectors (drinking water and health, hydraulic power, navigable waterways…). It guarantees common cause between users, equalisation between river basins, access to water for everyone. Coordination is ensured by the inter-ministerial water mission. The AFB is a public institution under the governance of the Ministry for the Ecological and Inclusive Transition. AFB has four major missions: mobilise research on the issue of sustainable management of water and aquatic environments, gain knowledge on the status and uses of water and aquatic environments, protect and monitor aquatic environments, and technical support for territorial management of water and restoration of environments. AFB also ensures compliance with aquatic environments regulations. They implement the objectives and provisions of the River Basin Management Plan (RBMP), by fostering well-balanced, efficient management of water and of the aquatic environment, the drinking water supply, flow regulation and the sustainable development of economic activities. Water agencies are financially autonomous and have their own financial resources coming from the taxes levied on the water uses. DREAL ensure consistency in implementation of the water policy at regional level. River basin DREAL play the same role at river basin level. A list of all the DREAL is proposed on this webpage. DDT implement the water policy in its regulatory and technical aspects at departmental level. A presentation of the DDT is available in French on this website. On 13 November 2009, the French Secretary of State for Sustainable Development announced the launch of a national action plan for the restoration of river continuity (circular on the implementation of this action plan) with five main thrusts including greater knowledge of weirs and dams, definition of priorities of action for each river basin, and assessment of the environmental benefits of the measures carried out. A national strategy towards the management of migratory fish (StraNaPoMi) has also been adopted in December 2010. It focuses on 4 points: preserve and restore populations and habitats, renovate the governance of the migratory fish management policy, enhance the acquisition of knowledge, monitoring and evaluation, and develop the sharing of experience, communication and training about migratory fish issues. The “Grenelle for the Environment” is also an important step in water resources management in France. This Grenelle for the Environment is a debate organised in France in 2007, with all stakeholders involved in environment and sustainable development. The commitments contained in this Grenelle were integrated into the law of 3 August 2009 and completed by the 12 July 2010 law. Its aims included the restoration of river continuity, and in particular the creation of a Green and Blue Infrastructure, with an aim to maintaining and reconstituting a network of corridors within France so that animal and plant species can communicate, circulate, find food, reproduce and rest. For more information: The Green and Blue Infrastructure in mainland France - Challenges and experiences. French and EU regulations (WFD, Water law, Stranapomi, Grenelle law and the Green and Blue Infrastructure, national river continuity restoration plan) thus make it mandatory to restore the river continuity of aquatic environments. They collectively require that water stakeholders increase their efforts and projects in favour of restoration. The restoration of river ecosystems also plays an important part in mitigating and decreasing flood risks, a key objective of the EU Floods Directive. By re-connecting brooks, streams and rivers to floodplains, former meanders and other natural storage areas, restoration increases natural storage capacity and reduces flood risk. Areas exposed to risks (TRI). At a national level, the Ministry of Ecology develops a National Flood Risk Management Strategy (called Stratégie Nationale de Gestion des Risques Inondation) that pursues three priority objectives: improving the safety of population exposed to flood, stabilising in the short term and reducing in the medium term the cost of flood damage, and significantly shortening the time required by affected areas to return to normal. For each major river basin, the prefect of the catchment area develops a Flood Risk Management Plan (called Plan de Gestion des Risques Inondation), involving all stakeholders. The Flood Risk Management Plan and the River Basin Management Plan have the same structure and the same timetable for implementation. The related Water Framework Directive and Floods Directive aim at an interconnexion between management of water resources and flood risk prevention. The Ministry of ecology website gives more information about this National Flood Risk Management Strategy. By law, responsibility for tasks related to the management of aquatic environments and flood prevention was recently conferred on municipalities (the “GEMAPI” competence). This document by Onema provides more information on the GEMAPI competence. 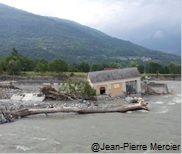 For examples of river restoration projects that integrate flood risk management in their objectives, you can check this dedicated Onema.fr webpage: Flood risk management and river restoration (FR).